The Mormon cricket has taken over the town of Murphy, Idaho, and residents say it's not the first time it's happened. According to residents, it was seven years ago when hordes of hissing, cannibalistic Mormon crickets swarmed the small town, climbing up the sides of houses, marching down the streets and consuming any crop in their path. These insects emerge in the springtime, grow 2-3 inches long and undergo seven stages of development (known as instars) taking 60-90 days before reaching adulthood. In the past, residents used a pesticide bait to get rid of these monster crickets. 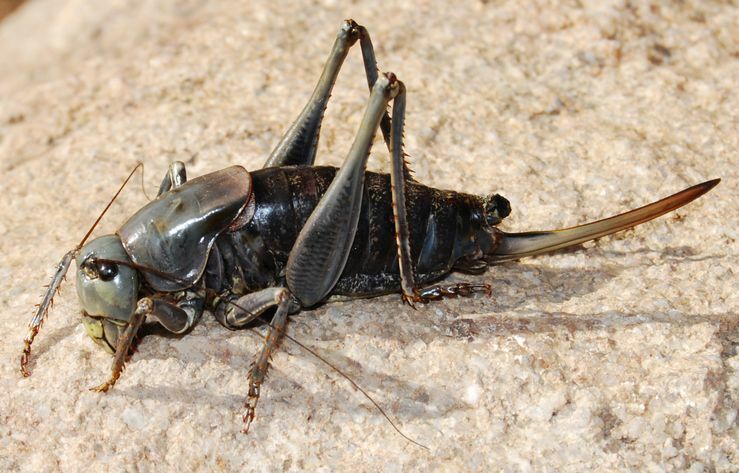 Since Mormon crickets are cannibals they eat the bait and then eat each other, annihilating the horde in droves. This time the bugs caught the town off guard, they didn't have the bait called "Sevin Bait" and the closest supply store is 30 miles outside of town. A pesticide called Dimilin can be sprayed outside city limits and targets younger, smaller crickets inhibiting their growth. In-town, residents are using Tempo, a general-use insecticide that is considered safe to use around children and pets. Unfortunately for most farmers, crop insurance doesn’t cover cricket devastation and there’s not much they can do in the aftermath. Online state-approved video courses are available 24/7. This entry was posted in Pesticide and tagged Idaho Pesticide Renewal, Pest Management, Pesticide, Pesticide Application, Pesticide Classes, Pesticide news.